How has technology changed our perception of a real “live” crowd experience? What is our role within a crowd in the modern world? Are we a participant, an observer or not present at all? 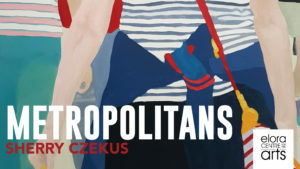 In ‘Metropolitans’, Czekus considers the crowd as an entity that forms as a result of the structure of the urban environment. Looking back to Flaneurism in the late 19th c in Europe, Czekus investigates the rise of urban culture as a social phenomenon where people took to the sidewalks of the city, as a way to see and be seen, interacting, socializing publicly. She records her experience and observations initially through video and photography and then employs paint and the process of painting to portray the urban crowd as a single entity. Abstracted segments of the figures and patterns on clothing dominate the shallow space in the paintings that attempt to illustrate the visual perception of the everyday experience of city life. The paintings conceal the identities of the individual figures caught in the scene in an effort to expose the identity of the crowd at large.This exhibition is sponsored by a donation from our caring community of women who attended the Black Dress Event. Thank you for supporting the arts in our community! Making my paintings begins with becoming one of the crowd as part of the everyday experience. On busy city sidewalks with my camera, I make my source images of the urban crowd and its figurative gestures, intersections and spaces between its members. Since the emergence of flaneurism and urban culture in 19th century Europe, the online social frontier has recently developed and has changed our visual perception of the physical crowd experience. Painting, as a conceptual medium, simultaneously expands and collapses these moments I capture as an enriched site of knowledge about us as a collective. Straddling the boundaries of representation and abstraction, I allow the photographic language give way to the language of painting.The physical crowd experience is continuously interrupted by the attraction of the social online community that can be accessed at all times through our handheld devices. It is this fleeting and fragmented sense of perception specific to our time and circumstance that poses problems in painting that I find worthy of investigation. The language of painting takes up the problem of presenting the crowd in an atmosphere that has yet to be determined in art. Sherry Czekus is a Canadian painter based in Waterloo, ON, who completed her MFA at University of Western Ontario in London, Ontario. She holds a Bachelor of Arts with Studio Specialization from University of Waterloo and a Bachelor of Education from Wilfrid Laurier University. She has exhibited her work in private and public art galleries in Canada and the United States.